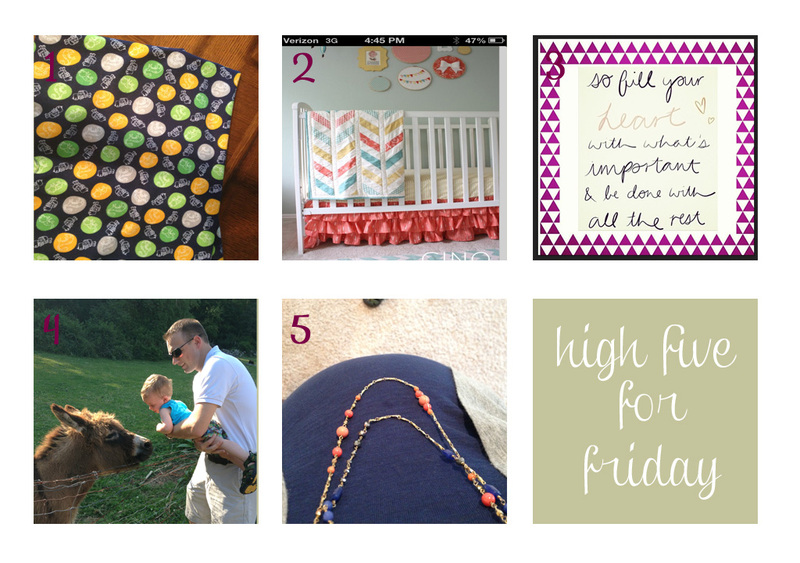 I'm linking up again today with Lauren over at Lauren Elizabeth for High Five for Friday!! 1)) I have attempted (and completed) my first crib sheet! I found some cute fabric for the girls beds, and not wanting P to be left out, found him this cute dinosaur flannel (though Ed insists from afar they look like golf clubs). 2)) This is the look I am going for for the girls bedroom, though a little different. I found it on Pinterest, but the original source is all from the mind of this lovely lady! 3)) I saw this on Instagram and absolutely fell in love with it! I am hoping to recreate it in some way to hang in the house. 4)) Earlier this week we took P to Cows & Cones which is a local farm/produce stand/nursery/ice cream stand. They serve delicious ice cream and have animals for the kids to pet. P loved the cows and here he is up close and personal with a donkey. Which he insisted moo-ing at. 5)) I took this picture this morning. My necklaces officially rest of the belly. It is certainly an interesting view from here!! Hope you are all enjoying your Friday!!! And I love your nursery inspiration picture! Can't wait to see the final product. My nursery was much more Functional than Adorable-- haha! I am figuring out how I want to decorate the boys' room when I move them all in together. That should be cute! I love the pic of your belly, so cute!!! I can't wait to see just how your nursery turns out. I know that I use Pinterest for many things, and I am always curious as to which are successful! I hope you have a great day!